Fine for the odd Wii game, but presentations aren't really an option. We could nit-pick its foibles forever, but there's something quite endearing about the PocketCinema. It handles MP3 music, picture slideshows and even MPEG-4 playback internally, which is a nice option to have, and includes ArcSoft conversion software to handle any compatibility issues. Its simplicity has its advantages, too: attach it to a low-resolution source like a games console or DVD player, and it's a perfect portable 40in display. 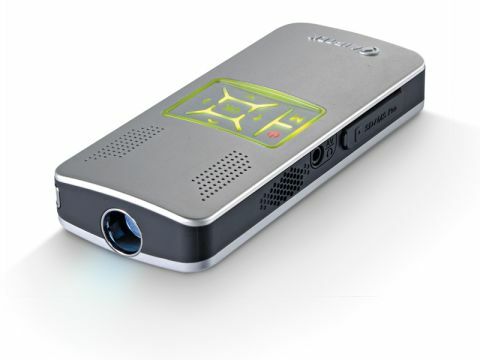 But the more we used the PocketCinema, the more it became clear that it isn't supposed to be a PC projector. Just getting a picture on it is hard enough, and while it's possible to make it project a very usable, focused image, the lack of keystoning means that it's very difficult to position usefully. And it has hit a very difficult price point. Chuck in an extra hundred or so pounds and you'll be able to get your hands on the real thing. Not as portable, perhaps, but infinitely more satisfying.